Although shoulder replacement is less common than hip or knee replacement, it is just as successful in relieving joint pain. Whether you have just begun exploring treatment options or have already decided to have shoulder replacement surgery, this article will help you understand more about this valuable procedure. 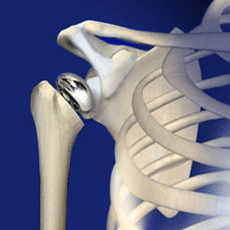 Several conditions can cause shoulder pain and disability, and lead patients to consider surgery. The decision to have shoulder replacement surgery should be a cooperative one between you, your family, your family physician, and your orthopaedic surgeon. There are several reasons why your doctor may recommend surgery. > Severe shoulder pain that interferes with everyday activities, such as reaching into a cabinet, dressing, toileting, and washing. > Moderate to severe pain while resting. This pain may be severe enough to prevent a good night’s sleep. > Loss of motion and/or weakness in the shoulder. > Failure to substantially improve with other treatments such as anti-inflammatory medications, cortisone injections, or therapy. **Call the office of Dr. Darren Keiser to set up an appointment & learn if shoulder replacement surgery is right for you.